Children’s picture book pop quiz: who wrote Go, Dog, Go!? If you guessed P.D. Eastman instead of Dr. Seuss himself, you are ready to appreciate the quirky delicacy us plant-based eaters call carrot dogs. And if you didn’t guess P.D. Eastman, hang on. You may be convinced once you read the tail–oops, I mean tale– of how I came to try–and love– carrot dogs. I have a genius of a recipe to tell you about from vegan food blogger and cookbook author Kathy Hester. 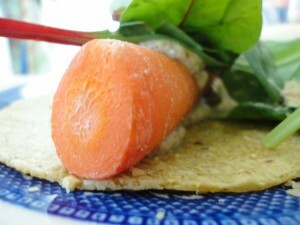 It’s where I got the method and the idea to twist the recipe for a different sort of carrot. One that’s too small to be a dog in a bun, but too tasty to pass up giving a special treatment. Since this is sort of a silly post, I have a silly confession to make. When I first found Kathy’s recipe at fatfreevegan.com, I was skeptical. Why would I want to eat something meant to go in a bun when there’s no easy-to-be-had low fat or fat free gluten free hot dog buns around these parts? I’m better off without bread of all kinds anyway. Why provoke that feeling of being left out? 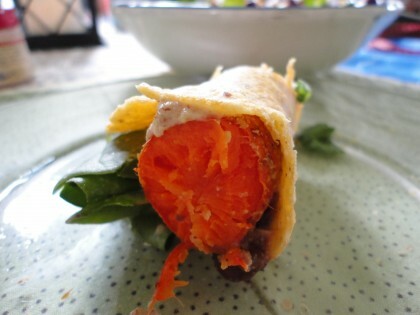 But I love carrots so much that when I came upon this thread about carrot dogs in the Food and Recipes Forum on Dr. McDougall’s site, I decided to find a way to make and to wrap my very own carrots dogs without the traditional bun. And I got hooked. My inner four year old kicked in and ate them every day for about 3 weeks. Or maybe it was my inner grade school girl, remembering hot dog days at our Catholic school without a cafeteria. The closest we came to a hot lunch ever was Thursday, affectionately known as “hot dog day.” On Tuesday we’d place an order. Did we want one hot dog or two? Did we want mustard? Ketchup? Relish? I was a mustard only kind of hot dog eater. The “hot dog ladies” (usually mothers of kids at the school) would bring large boxes into each classroom filled with steaming hot dogs all wrapped in their ordered buns and condiments. And there were also bags of Laura Scudder potato chips. I have no idea who cooked the hot dogs or where they came from. But it was the most fun lunch day of the week. 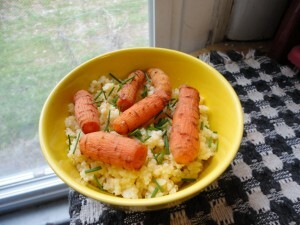 So if you want to take yourself back to your childhood, or the barbeque or the ball game where you used to enjoy a hot dog, try out Kathy’s basic recipe, Easy and Healthy Carrot Dogs at fatfreevegan.com. Or if you’d like your kids to have the fun of a hot dog without all the processed ingredients in both meat dogs and veg dogs, give them a carrot dog to munch on. and ate. And ate. And ate. I also enjoyed them wrapped in a large romaine leaf drizzled with my Lemony Pear Dressing and a little ground golden flax, but those disappeared before I thought to photograph them. I would have eaten them in a box or with a fox. Probably even in my house with a mouse, come to think of it. But I am confusing my Dr. Suess books. 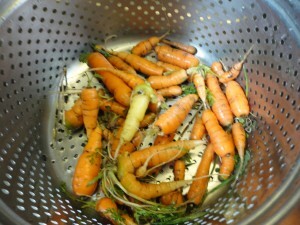 And there was still the question of those tasty little carrots I had discovered and dug up out of the garden. I wanted to make a marinade for them with a special twist that would make their sweet taste sing on top of a bowl of warm grains, like millet. And this is what I came up with. Mix all the marinade ingredients together. (Since the tamarind paste is quite sticky, it’s a good idea to start with working that into a small amount of the required liquid in a small bowl until it dissolves, then add the rest of the ingredients.) Adjust seasonings to taste. Then follow Kathy’s directions for cooking the carrots. Trim the ends off your carrots. Bring a pot of water to boil. Put in the carrots and blanch until fork tender. Rinse them under cold water to stop the cooking. Place in a plastic bag with the marinade (or as Kathy quips in her recipe, “use a container that has a tight lid so you can shake it without spraying it all over your kitchen”). Marinate for at least 4 hours. (I like to marinate mine overnight.) When ready to eat, bake in a 350 oven for about 15-20 minutes, until warmed through. Place cooked carrots on a bowl of warm grain. Sprinkle with fresh chives or parsley. Notes: I have this vinegar all made from last pear season. It sits in jars for weeks (true confession? sometimes months), and then I strain it. You could probably get away with 24 hours if you heated the vinegar and poured it over ripe cut fruit and cinnamon. If you don’t want to wait around to infuse your vinegar, you could try adding a little date syrup (a teaspoon maybe) and a cinnamon stick to your marinade and use plain balsamic vinegar instead. If you do this, mix the date syrup up with the tamarind paste using a fork and a small amount of the required liquid first to dissolve both, then add the rest of the ingredients. You can usually find tamarind paste in the Asian section of your grocery or food co-op or at an Asian grocery. It’s also available on line here or here. If you’re cooking big carrot dogs, you can cook them on a grill if you have one. I’m not so sure about carrot dogs but I love your story about hot dog day at school when you were a child. Our school had hamburger day once a week and it was much the same. You placed your order and someone, somewhere made burgers. Moms delivered them to the classroom. The best part: You could order a carton of chocolate milk to go with it. Best day of the week, hands down! Thanks, Stacy! Glad you enjoyed the story. I did fix the carrot dogs and both my husband and I enjoyed them. Just may have to give your version a try! Thank you Moonwatcher. Oh boy! Another reason to eat carrots, I love it! Wrapping it in a corn tortilla is genius – thanks. I think I’d like to try roasted parsnips also – yum! Thanks, Marcia! Hmm, parsnip dogs–I like that idea!! Next post: The Miracles Keep Coming. . .